Mulch is great for trees. It helps keep the weeds out, adds nutrients, protects trees from weedwackers, and helps trees survive dry weather and extreme temperatures. The list goes on and on. The ring should start about 3 inches from the trunk so the mulch doesn’t touch the stem. 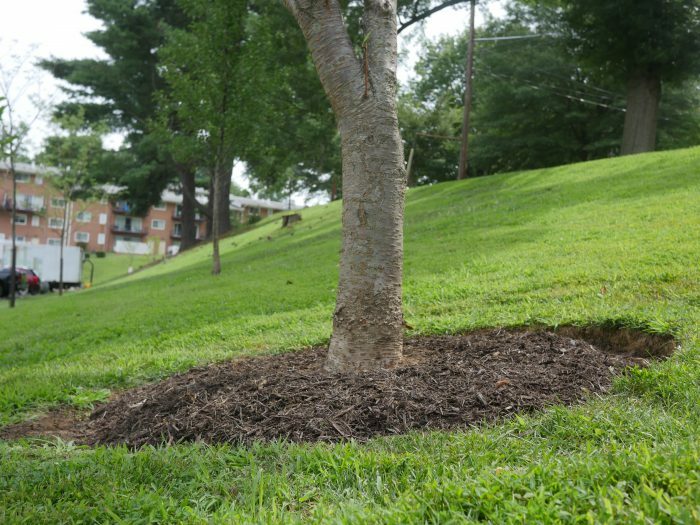 Say no to the mulch volcano – too much mulch around the tree and touching the stem can actually kill your trees! Download our mulch guide to learn the right way to mulch. Download a mulch meter – a pocket guide to measuring the right depth of mulch.